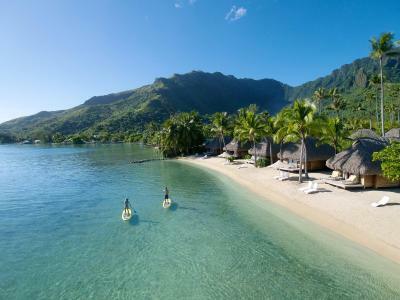 Lock in a great price for Manava Beach Resort & Spa Moorea – rated 8.6 by recent guests! Everything, location, services, staff is awesome, food was great! definitely the best! 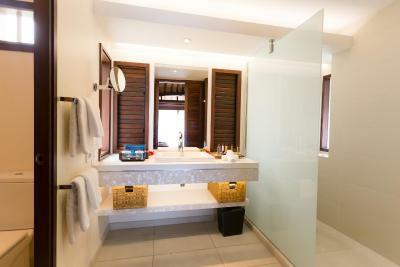 Clean large rooms with a great little amenities, the beach and pool bar were awesome. 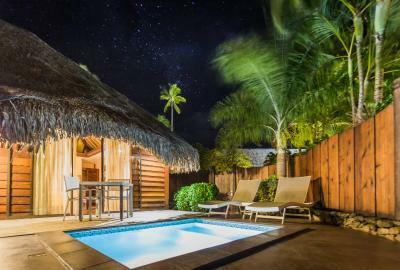 The cabana was large and bright with the perfect plunge pool to cool down. Very private and spacious. 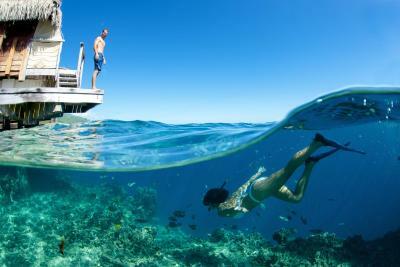 The marine life under our bungalow was out of this world! It was such a beautiful spot. The beach equipment, cocktails and excursion options were all fabulous. Great to have a supermarket and other shops nearby too. The hotel is nice and clean and we enjoyed our out stay. 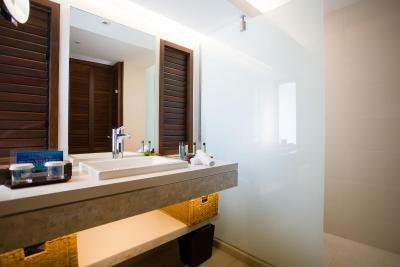 It is close to the airport and has a lot of of shops and restaurants in the near proximity. It also has a great dive center on site. 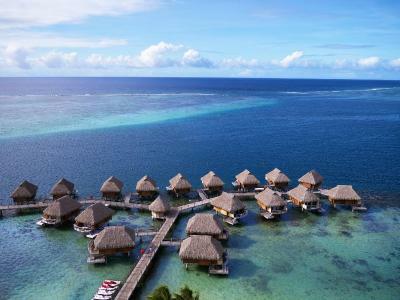 Price was better than most other overwater bungalows. Decent snorkeling just outside the room and walkable to shops. 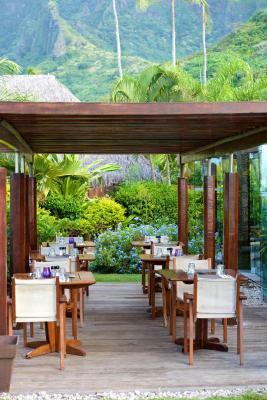 Beautiful location and the pver wayer bungalow was gorgeous. Incredibly friendly staff. Restaurant is excellent, and the Polynesian show on Saturday night is definitely worth it. The buffet was incredible! The staff were really friendly. I booked a room with a kitchenette and when I got there it was unavailable but they gave me complimentary breakfast and dinner as an apology. Taraina, the front office advisor arrange it all. The hotel is really close to the town where there is a supermarket and restaurants, very convenient. The staff was great and the location was close to shops and the local super markets. 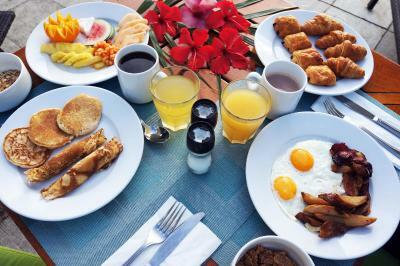 Great breakfast buffet. Easy walk to the village, which we did most days. Beautiful pool. 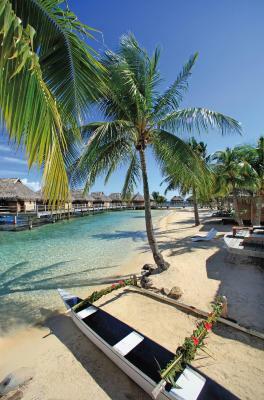 A wonderful escape from winter! 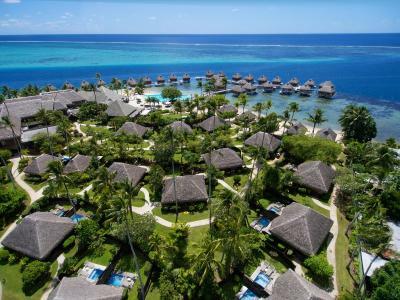 Manava Beach Resort & Spa Moorea This rating is a reflection of how the property compares to the industry standard when it comes to price, facilities and services available. It's based on a self-evaluation by the property. Use this rating to help choose your stay! 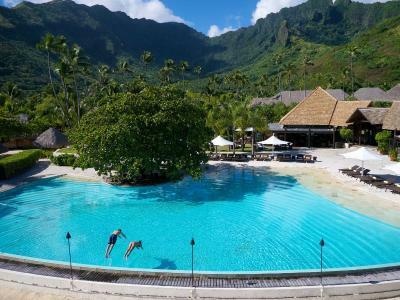 One of our top picks in Maharepa.Manava Beach Resort & Spa Moorea is a traditional Polynesian-style resort, located just 10 minutes’ drive from the airport. 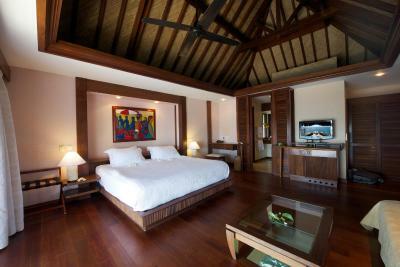 It offers garden bungalows with a sundeck and private plunge pool. 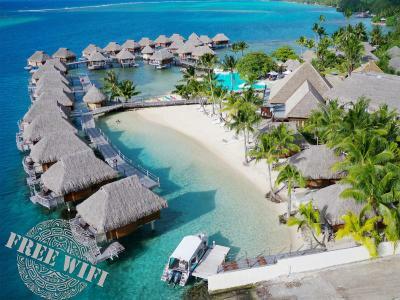 All rooms at Manava Beach Resort & Spa Moorea feature ceiling fans, air conditioning, coffee/tea making facilities and a mini-bar. 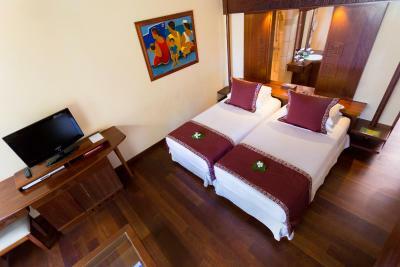 Other room facilities include a hairdryer, safety deposit box and flat-screen cable TV. 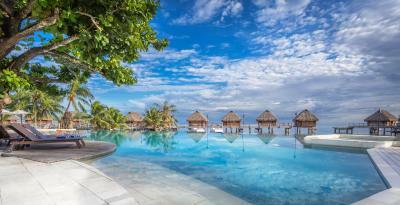 The resort features an outdoor swimming pool located on the beachfront. 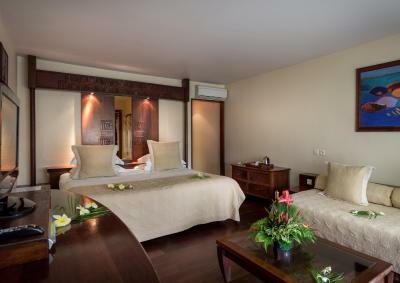 Manea Spa offers a range of massages and beauty treatments. 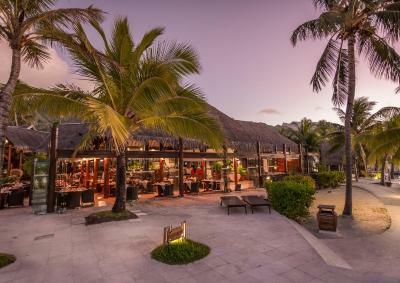 The Manava Beach Resort & Spa Moorea is opened every Friday and Saturday and hosts festive themed event for guests to enjoy. Manava Beach Resort & Spa Moorea is a 15-minute drive from the ferry terminal and 1.9 mi from the magnificent Cook's Bay. 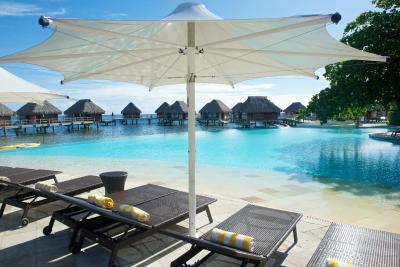 When would you like to stay at Manava Beach Resort & Spa Moorea? 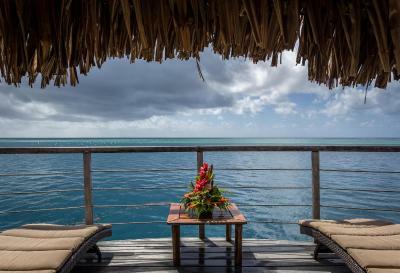 Facing the horizon and the deep ocean, this bungalow offers more privacy. 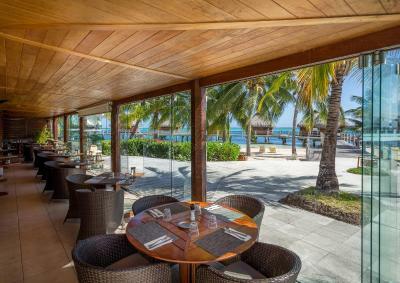 It has a large sundeck and sitting area with direct access to the lagoon, and a glass-bottom table inside to enjoy the marine life treasures directly from your sofa. 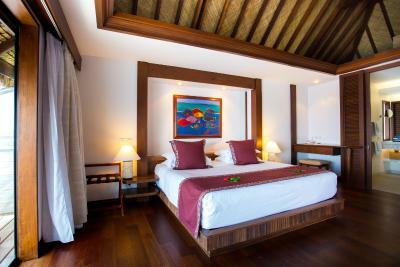 Located in the main building next to the hotel facilities, this spacious apartment offers two separate areas - a bathroom, kitchenette and living room on the main level, and the bedroom with king-size bed on a mezzanine upstairs. The apartment is equipped with cooking facilities, a lounge space with a sofa plus an armchair, 2 TVs, free Wifi and air conditioning. 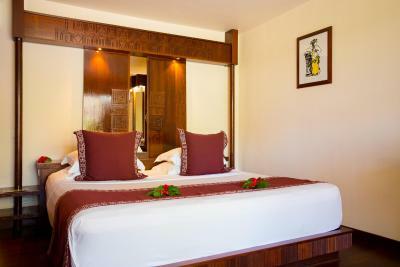 It is decorated in a combination of modern and Polynesian design. 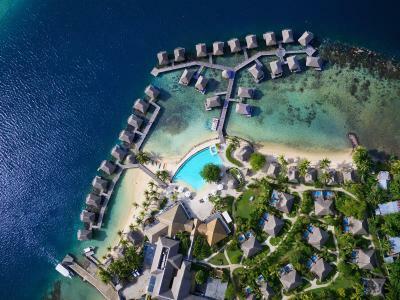 The hotel is built on the grounds of the first hotel built on the island, built by 3 young Californians, who invented the Overwater Bungalow! 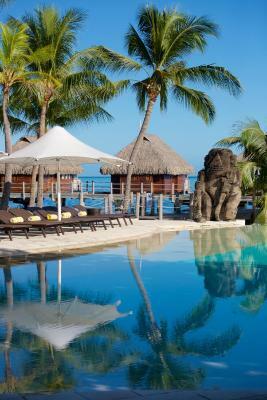 The resort features 3 stone tiki sculptures (mythical figures of Polynesia) to honor their memory. 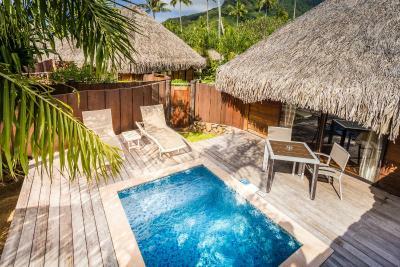 House Rules Manava Beach Resort & Spa Moorea takes special requests – add in the next step! 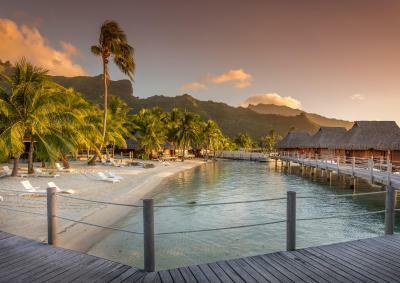 Manava Beach Resort &amp; Spa Moorea accepts these cards and reserves the right to temporarily hold an amount prior to arrival. 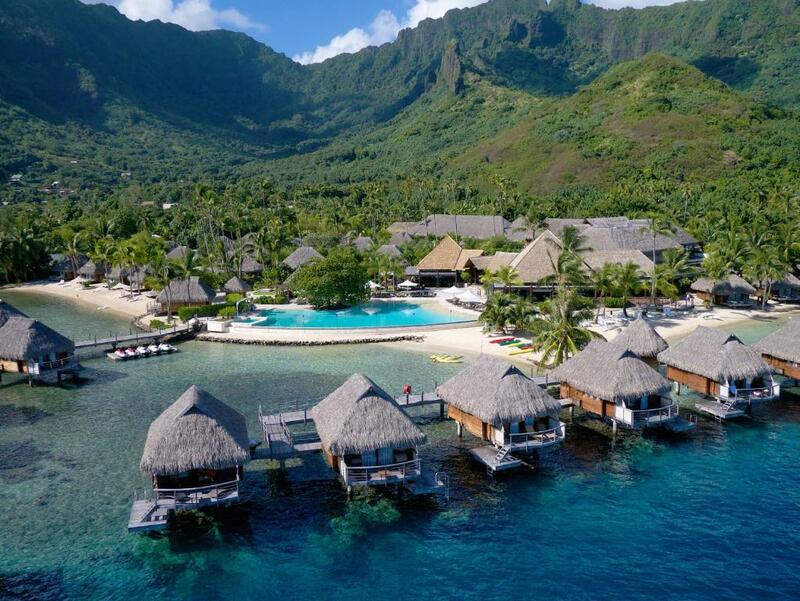 Manava Beach Resort & Spa Moorea accepts these cards and reserves the right to temporarily hold an amount prior to arrival. I would like to have had more time, I was there 7 days 14 would have been better. The fotos are totally misleading. We rented one of the villas on the water. What they don’t tell you. There is a ladder to the water, but it leads to a shallow field if Carl’s, so there is no way to use it. There is a tiny strip of sand beach but only two or three meters you can move in the water. Prices are absurd ( we had breakfast included, but were charged even for coffee. There is really nothing you. An do here. Bed was quite soft and the equipment usage hours should be longer than 5, it would be nice to paddle board sometimes at dusk. The breakfast options also could have included something less expensive. 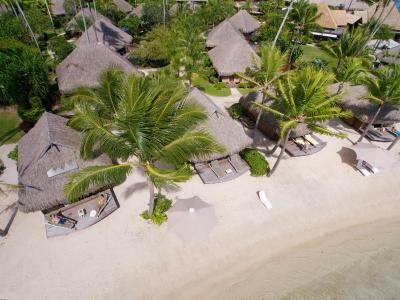 We thoroughly enjoyed our stay at the Manava Beach Hotel and Spa. 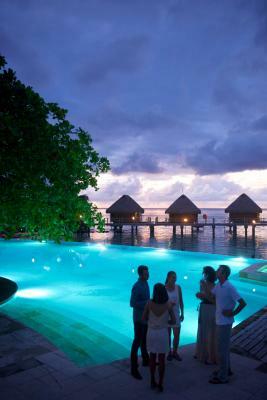 It is a small more intimate resort and that is why we chose to stay there after much research. 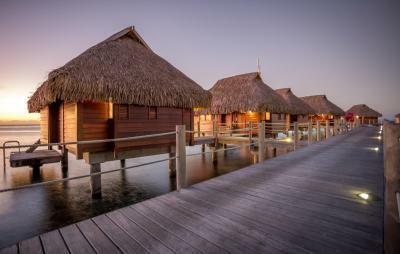 We stayed in one of the overwater bungalows that was very large and beautiful. 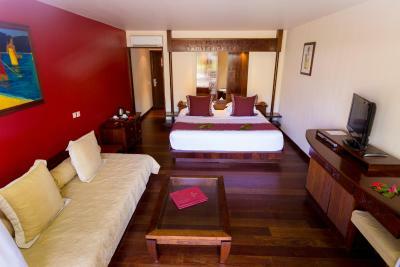 Room for three people with the large sofa/daybed in the room. Chihiro was the lovely woman who checked us in and showed us to our room. She was very accommodating and helpful. We even asked about getting access to watch the Super Bowl and she found out a place and reported back to us. The breakfast buffet was great with many choices. We enjoyed the evening entertainment one night with the Polynesian buffet, great food with many choices, also. The dive center is on site with great staff. 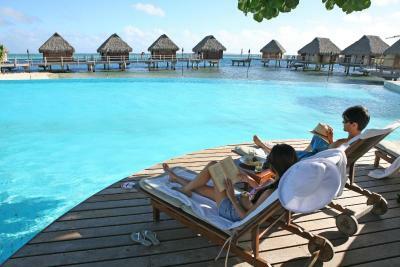 This is a quiet resort, if you are wanting a nice relaxing and small place to stay this is it. 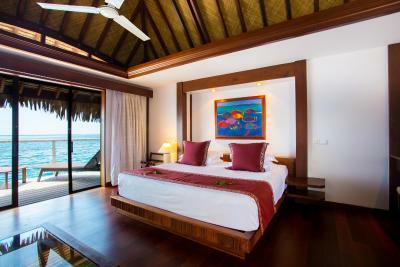 We did not have to walk two football fields to our bungalow over the water! The infinity pool is quite large and is deep enough to walk around with the water much higher than chest high (as in most other resorts). 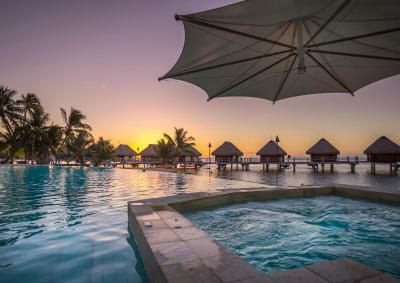 If you want a "party" hotel, it would be better to look elsewhere. All of the guests we met were very friendly. Everything was perfect even with the long rain and wind storm that we had to cope with. 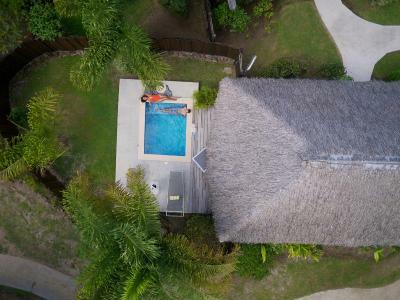 On our first full day the property held a 'beach party' which involved vast numbers of locals who came and attended a very noisy disco held by the pool from 11am to 5pm with lots of alcohol and raucous behaviour. At 7pm there were still people hanging around with litres of Vodka and making residents feel uncomfortable. lots of the resort guests were very very annoyed. We will not stay here again as I would not want to have another entire day ruined like that first day was. 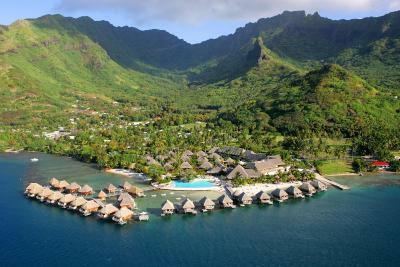 The resort is not comparable to the Hilton or the Intercontinental. The staff was not as friendly as in the other places. We enjoyed our stay though. The billing system is not completely accurate, as all the receipts for our expenses showed one of the taxes as 4%, but this appeared on our final statement at 5%. We saw the manager about that and he said that he was aware of the problem and was trying to get it fixed. Also it was bad that they did not give us a receipt for the room payment on our departure, as they billed us for my parents room as well ( so 10 nights accomodation instead of 5!!) I found this out when I checked on the Internet. Too outdated hotel. The roof is leaked when was rain. Value "coast-food quality" very poor, 20$ for cheeseburger which is like a rubber and COLD. Also please do not eat raw fish there .... after tuna tar tar we got pinworm. Staff could be more aware of how to handle particular questions. Amazing view. Amazing staff. Amazing property.